An illustration of the Foresight spacecraft proposal to swing by the Apophis asteroid to track its movements. A boxyspacecraft and its Georgia-based design team are $25,000 richer after winning aninternational competition to devise the best plan for tracking a space rockthat will swing past Earth twice in the next 30 years. 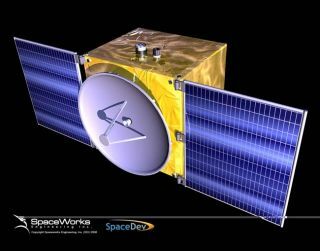 The smallForesight spacecraft designed by engineers in Georgia and California wonfirst place on Tuesday in the Planetary Society?s Apophis Mission DesignCompetition, which challenged contenders to come up with a cost-effective wayof launching a watch dog-like probe to Asteroid 99942 Apophis. Theasteroid - a space rock between 690 and 1080 feet (210 and 330 meters) wide - isexpected to pass by Earth at a distance of about 18,300 miles (29,470 km) onits first pass in 2029, then swing further out at about 30 million miles (47.9 millionkilometers) on the second approach in 2036, asteroidresearchers have said. But perturbations in Apophis? orbit between now andthen could alter the space rock?s course, prompting the need for furtherobservations to ensure it does not pose animpact risk to Earth, they added. To trackApophis with Foresight, engineers at Atlanta-based SpaceWorksEngineering, Inc. and Poway, Calif.?s SpaceDev drew up plans for a $137.2million-mission that would launch the probe atop an Orbital Sciences Minotaur 4rocket. Accordingto the plan, the rocket would launch between 2012 and 2014, with Foresightentering orbit around Apophis five and 10 months later. The probe wouldthen fly in formation with the asteroid, hovering about 1.2 miles (2 km) aboveits surface as the space rock circled the sun. Shaped likea cube capped with stubby solar panels, the 485-pound (220-kg) spacecraftmeasures about 34 inches (85 cm) in width and height, and sports a length of about26 inches (70 cm) in length. It is designed to carry an off-the-shelf radiobeacon for tracking, as well as a multi-spectrum imager and laser altimeter tostudy Apophis. ?We applaudthe innovative approach that the Planetary Society took toward soliciting ideasand solutions to this potential threat,? said SpaceWorks Engineering CEO JohnOlds in a statement. ?An open, prize-based competition was the perfectopportunity for a small, independent firm such as ours to showcase our capabilities." Competitorsfrom 20 different countries submitted 37 different Apophis-tracking proposalsto vie for a total of $50,000 in prize money from the Pasadena, Calif.-basedPlanetary Society. The contestis part of the society?s year-long Target Earth program highlighting the 100thanniversary of the 1908 Tunguskaspace rock explosion over Russia?s Siberian forest. Tuesday?s awardscameless than a month after an asteroid swung within 334,000 miles (537,500kilometers) of Earth on Jan. 29. Europeanteams based in Spain and France took home second and third place prizes of$10,000 and $5,000, respectively. Pharos, aspacecraft designed by engineering students at the Georgia Institute ofTechnology, won $5,000 in the Apophis contest?s $10,000 student competition, witha proposal for an orbiter laden with four probes that could be launched into theasteroid to study its interior. Three other student teams shared the remainingprize money. PlanetarySociety board chairman Dan Geraci contributed the total cash purse for the Apophiscontest, which was held with cooperation from NASA, the European Space Agencyand other organizations. ?We arevery happy that this competition inspired innovative designs to solve animportant problem that could affect life on Earth - as the dinosaurs learnedthe hard way,? said Bruce Betts, the Planetary Society?s director of projects,referring to the massive impact 65 million years ago. ?We hope the winningentries will catalyze the world?s space agencies to move ahead with designs andmissions to protect Earth from potentially dangerous asteroids and comets. ?